Aeolian (ay-oh-lee-un) Heart, the name I choose to do readings under, is a reference to the “Aeolian Harp“, a type of wind harp mentioned in poetry and philosophy throughout history. Some of the poets who wrote of the Aeolian Harp include Novalis, Emerson, Longfellow, & Thoreau. Aeolus was the ancient Greek god of the winds, who lived on the island of Aeolia. Most of us remember this god from reading Homer’s, The Odyssey, where Aeolus gives Odysseus the favorable winds needed to blow him back to Ithaca. Hence, a harp that is played by the wind is called an Aeolian Harp. The musical instrument, which sounds as the wind rushes through its strings, evokes a uniquely mysterious and haunting beauty. While listening to an Aeolian Harp, you must surrender to chaos and in that surrender, you will hear the universe sing! 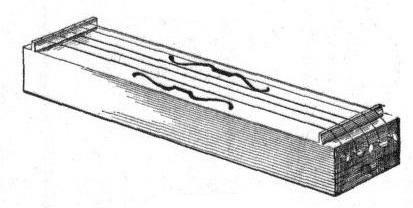 The Aeolian Harp became wildly popular during the Romantic Era, not only as a pleasurable source of music, but also as a poetic remembrance that there is always harmony to be found within chaos. Simple Aeolian Harp for the window sill. Poets and musicians have long known that they themselves are the mere instruments of a genius that flows through them, evoking sounds and images that create profound feeling in all who are present to enjoy. My favorite poem that refers to the Aeolian Harp is by Samuel Taylor Coleridge, where he considers that the transcendent power of inspired speech (poetry, prophesy, healing comfort) is just like the breeze that flows through the harp. An inspired speaker, teacher, or poet becomes like an Aeolian harp, allowing the “indolent and passive brain” to feel the beauty of the music and take over their body. My name is Rachel and I am an intuitive reader of astrology and tarot. I use the name Aeolian Heart because as a reader I love to evoke the idea of allowing spirit to freely flow, as the wind through the trees. In my mind, forecasting is a form of envisioning (just as reminiscing is) and so I use astrology and tarot to have insightful and healing discussions about the past, present and future. However, I will never tell you what is for certain, but only what can be if your love, will and desire merge into manifestation. The creative and spiritual path in life takes great courage and integrity, thus it is often plagued by fear, self-doubt and many questions… I find that astrology and tarot are the perfect tools through which artists and healers can ask deep questions about themselves and become re-invigorated to continue to evolve their inspiration and their passions. When people book a reading with me, they will find that our conversation will prompt them to clarify their intentions and to realize their highest potentials for creative self-expression.